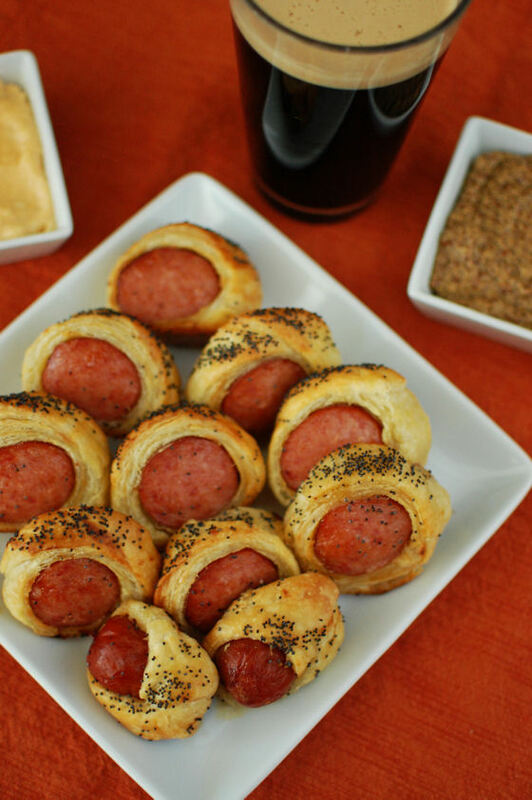 Classic Pigs In a Blanket get an update to more grown-up flavors. 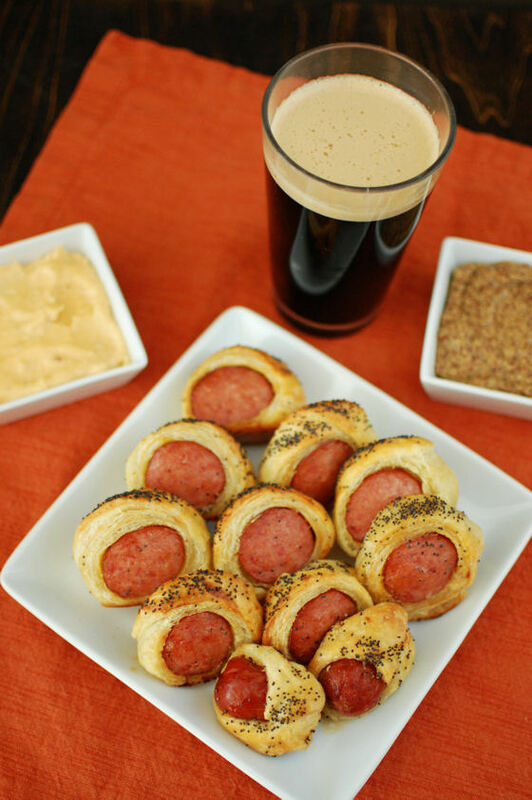 These smoked sausages, slathered with dijon mustard, and wrapped in puff pastry are sure to be a hit. I’m not a big magazine reader. I’m not really sure why, but I just never have been. And now with a Kindle, my phone, and a laptop, I have access to anything I’d want to read at most times anyways. On occasion when we travel, I’ll pick up a magazine to have on the plane, but now that we’re allowed to use electronic devices during takeoff, there isn’t really a need for that anymore either. Hubby’s mom gifts me a subscription to Martha Steward Living every year for Christmas. I find it interesting because it has food, crafts, and just general life articles. Now I look forward to relaxing and browsing through the magazine when it arrives. Especially if said relaxing includes a bubble bath, or wine. Even better, both. This past month’s issue arrived and it sat on the counter a couple of nights due to some crazy work stuff that’s been keeping me busy. 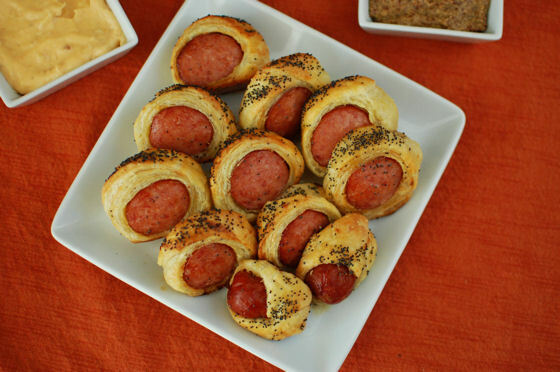 I finally had time last week to look through it while enjoying a bubble bath and some wine 🙂 For some reason, the recipe for grown up pigs in a blanket caught my eye. It’s not a new concept. 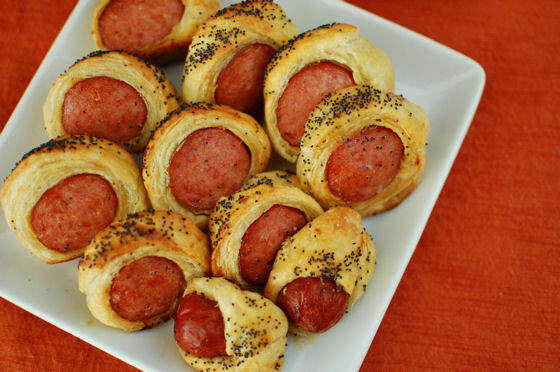 For as long as pigs in a blanket have existed, I’m sure there was someone out there making them fancier than just using a hot dog and crescent roll dough. For whatever reason, I couldn’t get these little guys out of my head, so I decided to make them the other night just to see what the fuss was all about. Let me tell you, these little guys are awesome. 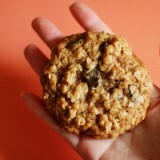 The “extra effort” required to make them is minimal with a significant benefit. I think my favorite thing about these is that you can make them ahead of time, freeze them, then just pop them in the oven to heat them up. 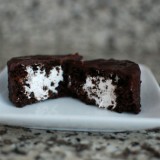 I am planning to bring these to a Superbowl party next weekend. 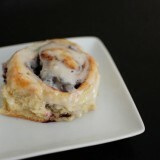 I’ve already got a double batch in the freezer and I am going to just bake them up at the party. You do want to let them cool a few minutes when they come out of the oven so you don’t burn your tongue, but once they’re cool enough to handle, I am sure they’ll disappear in no time flat. 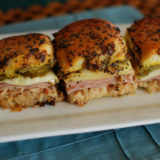 When I made the test batch the other day, I served it with some spicy mustard and cheese dip. I actually preferred them plain. The dijon mustard inside the puff pastry was enough of a something special for me. Hubby wouldn’t commit to whether he liked them better with mustard, cheese, or plain. He said he liked them all. I’m lucky he’s so easy to please. 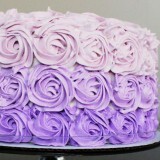 On a lightly floured surface, roll the puff pastry to a rectangle 12"x14". Cut in to 5 long strips (~2.5"x14"). 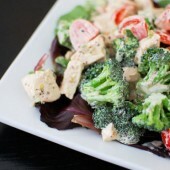 Spread each strip with one teaspoon of dijon mustard. Starting at one end, roll sausage with pastry strip, pressing seams together to seal. Repeat until all sausages are rolled. In a small bowl, mix the egg and water. 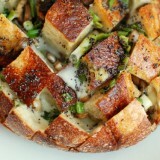 Brush the egg wash on the tops of the pastry and sprinkle with poppy seeds (or sesame seeds or cheese). Cut each sausage at an angle into 4 or 5 pieces. 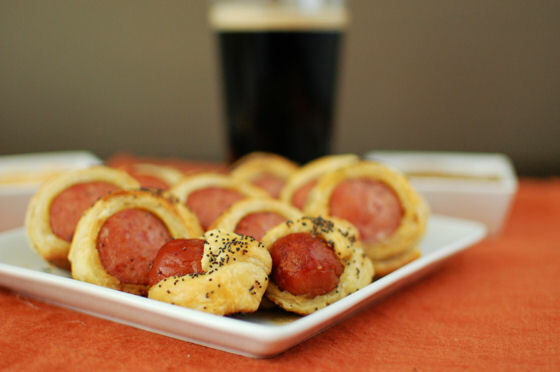 At this time the pigs in a blanket can be frozen on a parchment lined cookie sheet to be baked at a later time. When you are ready to bake them, preheat the oven to 400 degF. 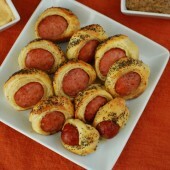 Place pigs in a blanket on parchment lined baking sheets and bake until the pastry is puffed and golden brown. This will take about 25 minutes if frozen, and 10-15 if not frozen.